Although I originally purchased the "dry" version of the Litomysl organ for my own use, this version uses the latest 24-bit wet Litomysl samples that also have multiple releases. 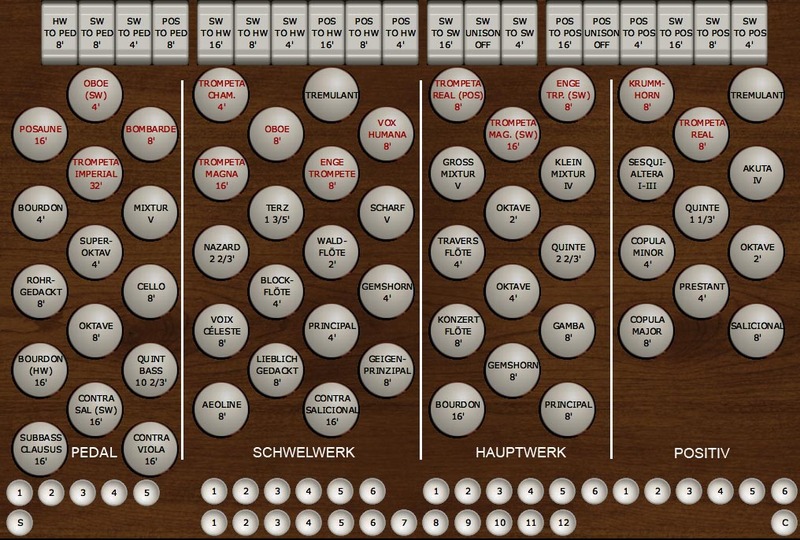 You must already own and have installed this version of the Litomysl organ in order to run my "modified" version. 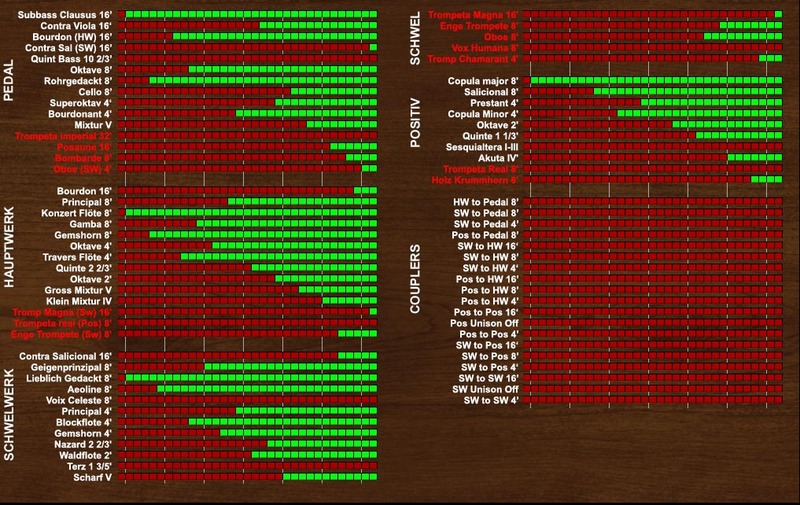 The dry version of my organ is now available as revoiced by Mark Williams. 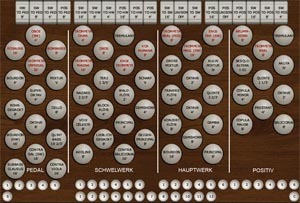 Version 3 of my organ has been updated to taker advatage of several new features in Hauptwerk 4. It will not run in Hauptwerk 3. 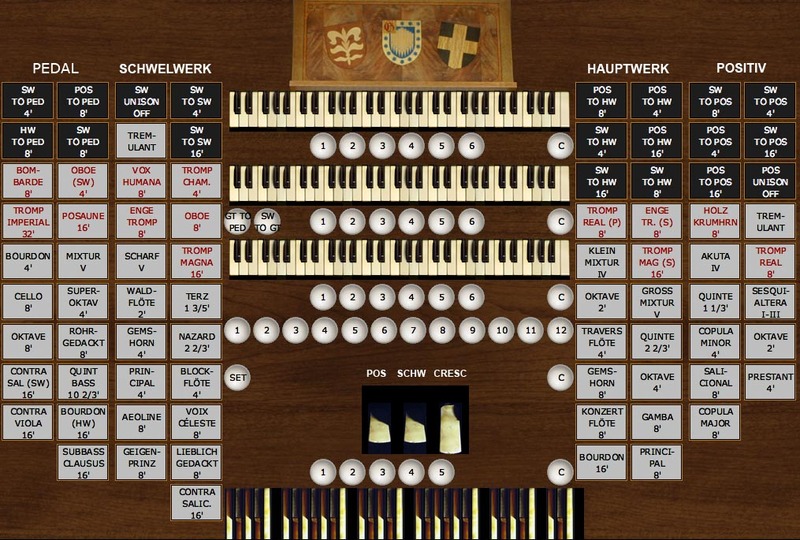 If you do not have Hauptwerk 4, you can still run Version 2 of the Modified Litomysl organ. Version 3 sports a crescendo pedal, courtesy of Al Morse's software plus my own special software to massage Al's output into the graphical displays I have created. This version also fully implements the fine multple release samples that characterize the 24-bit Litomysl sample set. I have also completey rewritten the tremulants. Version 4 repairs an error in the swell enclosures that caused ranks to sound brighter when the boxes were closed. I removed the Bombardewerk division, placed the 32' reed in the pedal, the 8' reed in the Positive (voiced as a chamade), and the 16' and 4' reeds in the Schwelwerk. I moved the 8' reed from the Hauptwerk to the Schwelwerk and revoiced all the Schwelwerk reeds to work as a convincing ensemble. I revoiced the Positiv Krummhorn to make it more of a solo voice that can be used to boost the ensemble. I discarded the "Great Cornet" since I could not see any use for it. I also got rid of the key and stop noise samples to save memory and make the organ run more smoothly. This is, of course, a matter of taste. I am not trying to recreate the sound of the original organ but rather I am trying to create a good performance and recording instrument for my own use. There were not enough reeds to give the Hauptwerk an independant chorus so I provided borrowing from the Positiv and Schelwerk to substitute here. I "deepened" the Schwelwerk box to give it more expression. 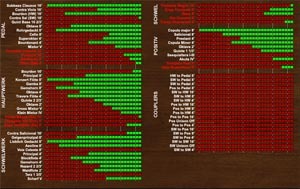 I also added a expression box for the Positiv. I left the Tromp Real out of the box as expected for a chamade rank. I added the 4’ Blockflote to the Schwelwerk in order to form a complete cornet in this division. The stop uses the samples of the 8’ Lieblich Gedakt for the first octave and the samples from the 2’ Waldflote for the remaining octaves. Despite the fact that this is a borrowed stop, the effect in the cornet is very satisfying and it fills in a serious gap in the original Litomysl specification. I added a second borrowed stop from the Hw to the Pedal - the 16' Bourdon - to provide some variety. I also added a pedal 4’ Oboe. It is borrowed from the Schwelwerk. Finally, I added a more complete compliment of couplers and general revoicing to bring everything into what, to me at least, seams like a proper balance. In previous releases I had left the wind model enabled and many users experienced problems with my instrumnents as a result. As an American, I have no way to use the wind model or even test with it. Hence I have disabled the wind model for this version. This is a standard Hauptwerk installation packages in rar format. Save to your disk, start Hauptwerk, and then use Hauptwerk's install feature to read the rar file(s) as per the manual. 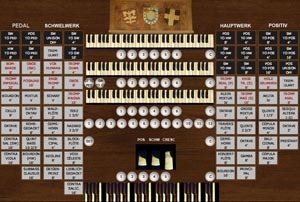 If you do not have touch sensitive keyboard, then you should also disable "key sensing" in the organ settings in Hauptwerk. Failure to do so will result in a sluggish and unusable instrument. I always make my CODM "source files" available for others who want to see how I did things or use them as a starting point for their own projects. Of course, the CODM version of this organ does not contain the crescendo pedal. Here is the CODM file if you want it. It is not necesary to load or run the organ. You will have to rename this file after downloading to "Les-LitomyslWet24_4.CustomOrgan_Hauptwerk_xmll." I could not get the download function to work properly with the new extra-long file extension required by Hauptwerk 4!